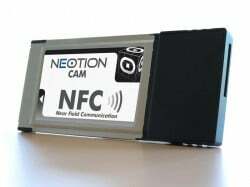 The NFC CAM allows pay TV providers to give subscribers the ability to transfer content securely from TVs to NFC phones, tablets and other screens, without the risk of piracy or copyright theft. The system can also be used to provide advertisers with a way to issue coupons to viewers. CAM: The NFC-equipped module plugs into compatible TVs and set-top boxes. Click to enlarge. French pay TV specialist Neotion and secure payments provider Alcineo have teamed up to develop the first conditional access nodule (CAM) with built-in NFC. The new technology enables access rights for paid-for content to be transferred securely between a compatible TV or set top box and NFC phones, tablets and other TVs, allowing subscribers to watch content on their device of choice while also protecting the content owner from the threat of piracy, copying and copyright theft. The device creates a secure channel for data exchange between the TV, CAM and mobile devices and supports individually purchased items of content, monthly subscriptions, purchases of virtual content and identity certification as well as the transfer of access rights. “Just imagine that you can subscribe to a pay TV package from your smartphone, then just bring it close to the Neotion CAM NFC inserted in your TV to transfer the acquired rights and to enjoy the broadcasts immediately; or that you can even purchase video on demand (VOD) from your smartphone with a simple click and then transfer the rights to your TV, or transfer the rights of the channel watched on the TV to another TV-type screen or tablet by means of the NFC interface,” says Christophe Genevois, Neotion’s technical director. The Neotion-Alcineo NFC CAM will be demonstrated at the IBC 2011 broadcast industry trade show in Amsterdam this week.